How To Remove Unwanted Toolbar From Browser ? You are here: Home / Security / How To Remove Unwanted Toolbar From Browser ? You might have noticed many adware and unnecssary toolbars installed in Internet explorer & other web browsers.The adware toolbars causes many problems like increases load time of browser,irritating pop-ups,cluttered screen space.. etc.Some toolbars modify your default home page also. Usually these toolbars gets installed when we run setup.exe of software which has these toolbars binded in the setup files, and generally users ignore these default options checked while installing these softwares. 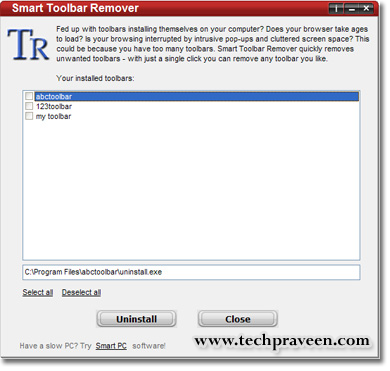 If you don’t know how to remove toolbars from your browser window then try Smart Toolbar Remover.Smart Toolbar remover make your work easy.It is quick and easy! Just check the box next to each toolbar you want to remove, and get rid of them all with the click of a button! When you restart your computer.